W hen deciding how to install the batteries, it's useful to study photos. In the first photo is my setup for a lead-acid pack. Lifting up the rear, you'll see 4 Optima batteries plus Powercheq battery balancing modules on the shelf on the right. Note, the addition of a spatter shield wall that I made of fiber cloth with resin. I later added a rubber skirt for additional length plus a chain spatter shield. Since doing that, water has not been a problem for my BugE. The next photo is from Allen Clark's installation. He decided to mount the lithium batteries to one side. This frees up some space for battery management electronics. In addition, I'm hoping I can fit a small 12V battery for emergency 12V accessory power. This would be needed in case the main pack goes into an unexpected shutdown while on a journey. If I was to use this configuration, the center hole in the front of the battery tray where the 12V harness goes through can not be used. Instead, a second hole would need to be drilled to the right. Fortunately, I left enough slack in the 12V wire harness that moving the pass-through location will not be a problem. 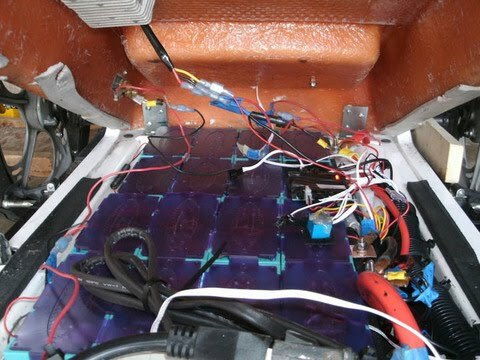 So, to check the arrangement of battery electronics and to avoid doing too much in a confined area, I decided to set up the lithium pack and electronics outside the BugE first. One issue I ran into was the inability of arranging a battery pack in series just by using the provided jumpers. I finally just made a cable to complete the series circuit (the brown cable on the bottom). The arrows trace how the jumpers make the cells into one big series circuit. The arrow path shows how the circuit begins at the (-) terminal and ends at the (+) terminal. Also, note the small stubby screwdriver on the lower left. When it comes to working on batteries, it's safety first! Either use a small stubby tool or at least wrap the metal stem of a regular screw driver with electric tape or heat-shrink so accidentally dropping it on the pack can't cause a short! An alternate way of arranging batteries was suggested by Baka Nihao although his batteries are different in shape. The batteries in his tray are arranged in parallel and held in place for the season with "great stuff" insulating foam. I asked about battery management. He uses none. He also brought up an interesting point on having a separate 12V battery for lighting. If I was going to use a 12V battery for lighting and have it charge from from the main pack via a DC-DC converter, the battery will be in danger of being over charged. Unlike Baka's setup, I have a 12V battery management system that will need continuous 12V power to balance cells in the large pack even if the pack needs to be shut down. So, I'm using an independent 12V motorcycle battery for powering the BMS. I'm going to try using a solar charge controller that I have left over from a previous project. The LiFeMnPO4 pack and BMS arrives. What next?